Meditation is the process of regulating one’s attention in order to obtain insight, increase awareness, and better understand one’s surroundings. While meditation may be achieved in any number of ways, most meditation includes the relaxing of an individual’s mind and body. Meditation is usually used with the goal of achieving better understanding of the world, inner peace, and enlightenment. The effects of meditation have by now been well documented. Regular meditation has been shown to aid relaxation, and to encourage brain activity in areas that are not associated with stress or fear. Western cultures tend to meditate to improve concentration and improve athletic performance, as well. Meditation has been used for millennia, and is most famous for its use in parts of Asia. It is a significant aspect of a number of Eastern culture staples, such as yoga, the martial arts, and Buddhism. While meditation had long been popular in the East, it became more widely practiced in the West during the 1960s because of its endorsement by the Beatles, one of the most popular Rock and Roll bands of all time. Before the Beatles, however, many distinguished scholars on the subject of meditation visited the United States to talk about everything from Buddhism to Zen to meditation. Later, scientists in the West began to study the ability of meditators to control bodily functions such as heart rate, blood pressure, and the production of stress hormones. Herbert O. Benson, a professor of medicine at Harvard University, postulated that this physical control exhibited by meditators was “the relaxation response”, a response similar to what is achieved through deep relaxation. Benson also found that persons who meditate show increased brain activity in the areas that control the autonomic nervous system, which controls automatic bodily functions such as digestion and blood pressure. Additionally, other studies have shown that meditation can be so powerful as to change the structure of the brain. Meditation is unique in that it requires no equipment, is easy to learn, and can be done by anyone. That said, the practice of meditation does yield better results. Experienced meditators are able to achieve enhanced concentration (and may even be able to meditate in crowded areas), alertness, mental efficiency, and productivity. After a time, some meditators report lowered blood pressure, lowered heart and breathing rates, reduced activity of the sympathetic nervous system, reduced stress, and increased levels of melatonin (which regulates the sleep cycle). There are a wide range of manners in which meditation can be learned, including through sessions taught for groups or individuals, through books, the internet, or other audio-visual materials. Most types of meditation share the common trait of seeking to quiet an individual’s inner dialogue that is constantly running. Once the mind is separated from the common everyday ruminations, the individual may experience non-judging awareness and physical relaxation. 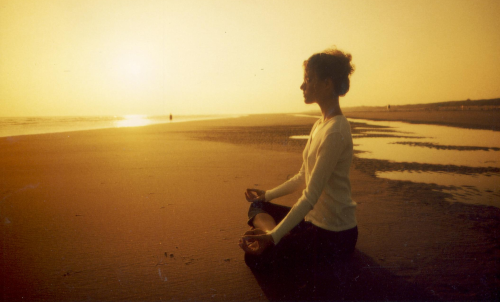 Transcendental Meditation (TM) is one of the most famous forms of meditation. It was popularized in the West by Maharishi Mahesh Yogi in the late 1950s and early 1960s (and was practiced by several members of the Beatles). Transcendental Meditation involves the repetition of a single sound or syllable, either aloud or in an individual’s head. Even as other thoughts enter a person’s consciousness, the individual must return to the chosen sound, or “mantra”. The mantra is believed to have a sort of “vibratory” effect, and each mantra is chosen by the TM teacher for the individual meditative student. The goal of TM is to achieve relaxed awareness and enhanced consciousness, also known as “pure awareness”. While the positive health effects of Transcendental Meditation have been shown, other claims made by practitioners include the ability to alter the mental states and emotions of others, to increase IQ, to fly or levitate, and reduce propensity towards violence. Another common form of meditation is Zen Meditation. Zen meditation instructs the individual to sit in a pyramid like shape (like a Buddha) while focusing on deep, even breathing. Once seated in the correct manner, the individual begins counting until their attention wanders. If it does, they begin counting again. The goal of Zen meditation is to achieve singularity of mind, the ability to focus on one thing for a long period of time. Stress reduction is one of the most common uses of meditation, and meditation has been shown to reduce stress in a short period of time. Meditation for stress reduction often focuses on replacing thoughts of stress with healthier more positive thoughts. A study by the University of Massachusetts Medical Center showed statistically significant improvement in symptoms of 22 patients with anxiety disorder who practiced mindfulness meditation. Kundalini yoga has been shown to help aid depression by reducing mental fatigue and increasing energy in cancer patients. Mindfulness-based meditation has been shown to help reduce depression as well. Fatigue has been shown to be reduced by regular meditation, which can also boost alertness and energy levels. There are claims that meditation helps to relieve insomnia by regulating the sleep cycle, though this has not been proven definitively. The practice of TM among the elderly showed improved learning, cognitive flexibility, and mental health, according to studies at the Maharishi International University in Fairfield, Iowa. Additionally, TM was shown to correspond with lowered blood pressure and decreased aging effects. Over the three year study, all participants practicing TM survived, while only 87.5% of persons undergoing a mental training program lived. In 2002, Psychosomatic Medicine published a State University of New York study which reported that meditation reduced abdominal pain, diarrhea, gastritis, and bloating among patients with irritable bowel syndrome. However, the study was only of ten patients, and more research is needed. Meditation resulted in faster clearance of skin lesions among patients with psoriasis, according to a 1998 study in Psychosomatic Medicine. According to a 2000 study published in Stroke, the thickness of the carotid artery lining was reduced after six to nine months of practicing Transcendental Meditation. This thickness is an indicator of the likelihood of stroke. TM was shown to increase the ability of patients with coronary artery disease to work out, according to a study by the State University of New York in Buffalo. Another study by Texas Tech University found that meditation may reduce anxiety of women who have heart disease. A study of 77 patients with fibromyalgia at Newton Wellesley Hospital showed that ten weeks of meditation-based stress reduction tended to improve well-being, reduce pain and fatigue, and prevent sleep disturbances. Loving-kindness meditation, a type of meditation which tries to change anger into compassion, was able to significantly improve the lot of 43 patients with persistent lower back pain. This study, conducted by Duke University and published in the Journal of Holistic Nursing in 2005, also found reduced feelings of anger and psychological distress. Meditation was able to significantly improve the anxiety, depression, and insomnia that commonly affect recipients of organ transplants, according to a study by the University of Minnesota and published in Progress in Transplantation in 2005.